About two years ago, I wanted a few more melody notes below the 3rd string C, so I put on a low G string. Suddenly, I could play C chord melodies which previously I could only play in the key of F! In the key of C, “I’ve” is a C. And “Oh?” That note is LOW G. You can’t play it in that deep octave with a high G string. You can play it up an octave, but then all the rest of the melody goes way up the neck. So folks might play this tune in F, since you just have to set up an F chord, and you have the “Oh” on the 3rd string, and “I’ve” on the 2nd string. That’s what we typically do for this type of tune. “Amazing Grace,” “Taps,” a number of tunes start with a low note, then jump up to the key note or tonic. But C is such a good key on ukulele, and I just kinda like being able to play these melodies in the low octave. So I have a uke set up with a low G. And luckily, I have more than one uke, so I can set up another one with a high G for other songs. High G is plenty neat, though. 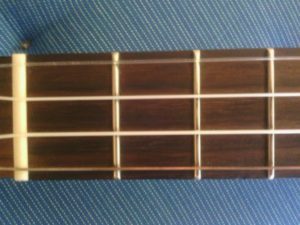 It’s tuned a step away from the high 1st string, so with those two outside strings you can get some really beautiful “close” chord voicings, where you have two notes in the chord which are only a step or a half-step apart. This creates a haunting, poignant, harp-like sound. In fact, there’s a whole style of melody playing built around this relationship between the outside two strings, called “Campanella.” Check out John King’s book “The Classical Ukulele,” which features arrangements of classical pieces and really makes the most of the high G reentrant tuning. High G or Low G? Like all musical choices, it’s matter of taste, tempered by practical considerations, and also by your own relationship to the larger world of ukulele culture and communities. Which Ukulele To Start With? This blog is a place to share ukulele lessons and thoughts, courtesy of Wildflower Ukulele Instruction. I’m Tad Dreis, a ukulele teacher in Keene, New Hampshire. I’m also a singer-songwriter with four albums.